Initially we thought it was a young Cottonmouth…. Being near the water, and with the surrounding wetlands and fields. We’ve seen a few of them and their skins on our hikes through the Florida flatwoods and swamps — which is why I always wear my boots when we’re out and about! It’s their land, after all. I’m thankful to visit, each and every time. But we realized it was far too bright, even for an infant Cottonmouth — besides, this was an adult (this realization reached after the human male jumped excitedly over the embankment to get a closer look). I researched it later, as I had honestly never seen one, in all my years here. 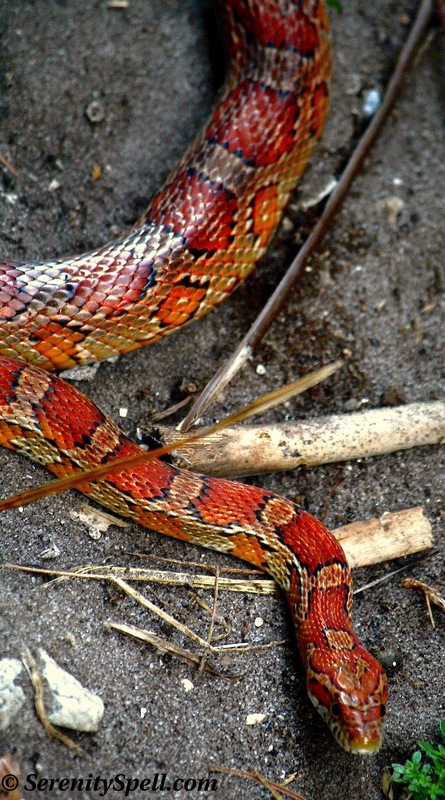 It’s a Corn snake — otherwise known as a Red Rat snake, apparently quite common. The term “Corn snake” — dating as far back as the mid- to late 17th century — arose when southern farmers stockpiled their harvested ears of corn, attracting rodents. The rodents in turn attracted these snakes. Corn snakes are found throughout the Southeastern and Central US, and are known to be extremely docile — not biting easily, and not aggressive — making them “ideal” pet snakes (boo). Averaging 3.9 – 6 feet, they’re considered a moderate-sized snake, and prefer habitats such as overgrown fields, trees, palmetto flatwoods, and abandoned buildings and farmlands. They host a wide variety of color and pattern variations, as well. I’m still in disbelief that I haven’t seen one of these lovelies on any of our hikes — they’re pretty hard to miss. Nice looking but not a pet for me!! BUT , interesting information. A dear friend of mine has one of these tattooed on her. They certainly are lovely creatures. I am quite fond of them! Thank you for sharing these photos. Wow – a bit intimidating but really really lovely! He was a big guy, but they’re known to be quite docile. But I always give snakes in our area a wide berth when we’re hiking, just in case we run into (read: surprise) a not-so-docile guy, heh! But the colors, so amazing! Isn’t he gorgeous? I still can’t believe this is the first time I’ve seen one of these guys, so funny… As bright and colorful as they are! I was tring to photograph a butterfly and almost came face to face with a striped garter snake on a blackberry bush. He wasn’t nearly so pretty as your corn snake though. Hahahah! Ohhh… Do you know how many things I’ve come face-to-face with, photographing and chasing butterflies? Banana spiders (harmless, but enormous) and alligators tend to be the most popular with me, as I’m stumbling around in my butterfly-fog. I just can’t believe we hadn’t seen any on our hikes — we’ve seen PLENTY of Cottonmouths, Black Racers, Glass, Green Vines, Browns (even a HUGE one in our closet, that’s still a mystery). But ditto to the coral snake! Never seen one in the wild, yet…. I just snapped a nice close-up of an Orange Rat Snake — now, he was a bit angry. he is a pretty snake! I love to see snakes in the wild, but I’m super cautious. One time we saw an eastern hognose snake. I didn’t know what it was at the time or I would’ve played with it…just once…apparently those snakes play dead and it’s pretty fun to watch. 🙂 they gag and everything. but I do usually leave wildlife alone and just watch. DITTO! You’re far braver than me, though — I leave the playing of the snakes to the male, hahah! I just leave all wildlife alone…. Well, after I briefly HARASS them with my camera, that is! It IS hard to tell differences with the snakes — like this one, which could easily pass for a young Cottonmouth till you saw its size. Fantastic photos, as always. It reminds me that we have Milk Snakes in Iowa, very colorful, white, red, and black, and almost no one ever sees one. But back to Corn Snakes. Snake hobbyists have been captive breeding them for years now and have developed all sorts of color variations. (Google and see for yourself, it’s amazing!) The good news is that with all of the captive ones, which can be bought for as little as 20 dollars, there is absolutely no reason to take a Corn Snake from the wild! Thanks so much! Wow… Your Milk Snake sounds a bit like our Coral Snake, which isn’t something we would want to run into, heh!! 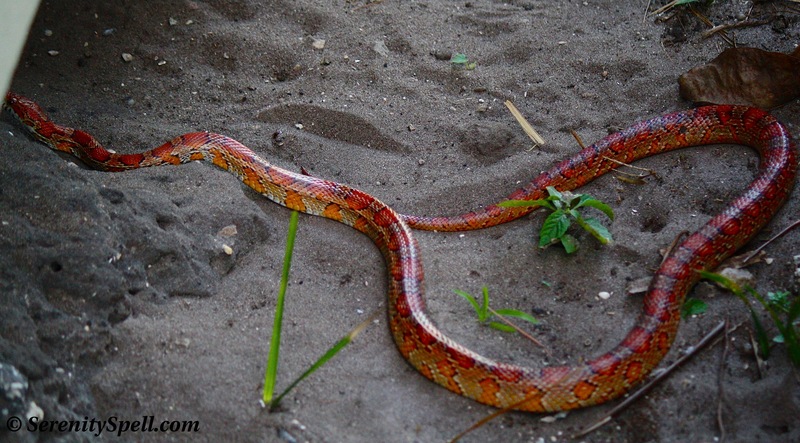 I saw the abundance of color and pattern variations / morphs of Corn Snakes — it’s pretty amazing how many there are! And you’re absolutely right, it’s good to know that there won’t be the temptation to snag them from their wild environment, a habitat in which they’re already accustomed, and throwing them into one which is created, potentially inciting understandable aggression.